If you are a religious person, chances are good that you are highly desirous to teach that religion to your children. You want them to know what you know and have a testimony of those things. Children need to develop their own testimonies–they can’t (and won’t) rely on and believe your testimony forever. At some point the decision will come to them–do I believe or don’t I? Let me assure you that teaching the gospel is something that requires the slow and steady approach. You need to be consistent in your small efforts daily. You don’t need some grand, pinteresty event that will give your child a testimony one day and you can call it good. You need consistency in your actions. You need small and simple things. These things are not grand. You will not read these ideas I am about to give and be impressed with this new, big idea I have come up with. Think tortoise here. We parents are all tortoises in slowly building up our children’s testimonies. Your children can’t know the gospel and gain a testimony of it without hearing about it. And they need to hear over and over. We are commanded to study the scriptures (see John 5:39). Reading with your children gives you the chance to teach the meaning of scriptures and thereby testify of things daily. To be successful at family scripture study, choose a time of day you know your family can be consistent at it. I have written on Family Scripture Study in the past, so read that post for more details on making it work. Let me also make a note–encourage your children to study the scriptures on their own. This is of course easy for the reader, but even McKenna did this each morning thanks to easy modern technology. All it takes is an app with scriptures that will read aloud (you could also do this “on tape). We have family prayers together each night. After we are done reading scriptures, we all kneel in a circle and take turns each night saying the prayer. This is a great time for you to be able to teach your children how to pray, through instruction and example. Don’t be fooled; every family prayer is not going to be this calm, peaceful moment. We got to a point where I declared any irreverence during the prayer would mean we repeat it until everyone could get it right. The thing to remember is that as you do it consistently, the effort over time does pay off. You are slowly painting a masterpiece, stroke by stroke. We pray before each meal. I also really like to say a family prayer with my children before they leave for school, but this is an area we really can improve on. I remember about half of the time in the morning rush. It is helpful to teach your children to pray on their own. We teach our children to pray individually each morning and each night before bed. Also teach your children that they can pray any time they need to pray. This is a really great thing to do to build family unity. 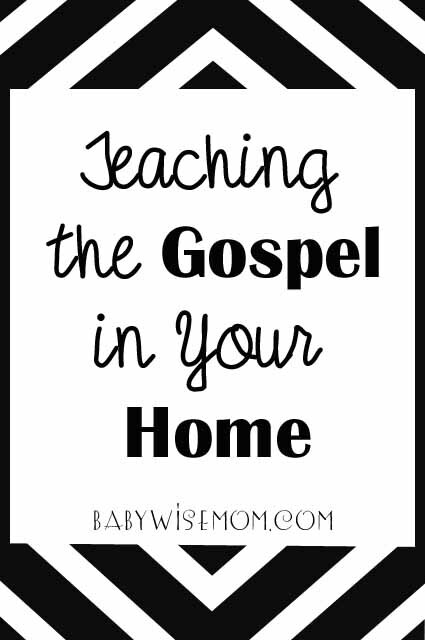 It gives you another forum for lessons on officially teaching the gospel to your children. It is a fantastic opportunity for your children to take turns teaching. Teaching requires bearing of testimony, and bearing of testimony strengthens testimony. Read my post on Family Home Evening for full details. There are powerful benefits to having this in your life. There are many holidays that are centered on the gospel, like Christmas and Easter. Take times like these to teach the true meaning of the season. I have found singing songs that talk about the religious side of the holiday is a great gateway to children asking questions about things, and when children ask questions, they listen to the answer. Having everyone sitting at the table together is an excellent chance to talk about life–daily life and the bigger picture of life. Every meal does not have to be a preaching session, but gospel topics can naturally come up as part of the discussion as it makes sense. See my post on Prioritizing Family Meals for more on this topic. You can work discussion into bedtime. You can tell scripture stories as part of your bedtime stories. You can be open to answering questions as you tuck your child in. Children often are willing to talk more at bedtime (delay tactic!). Take advantage of this time that they are willing to talk. I have talked before about Triad Communication. Basically, when you are both focused on something else, it is easier to talk about things. Stay mindful of chances to bring in gospel topics as you are working together. You can relate experiences to the experiences of those in the scriptures (and this, of course, requires that you have a familiarity with the scriptures yourself). I very recently discussed having Private Interviews with Children. See this post to learn all about it. Do things together as a family that are fun. Spend time with your children. Doing these things with your children will help your children feel close to you and feel love from you. They then will respect what you have to say more and be willing to come to you with questions more. Children will no doubt some day have a doubt or two (or many) about the gospel. That is a pretty normal thing for most people. You want your children to feel comfortable coming to you with those questions and not seeking sources that do not have your child’s best interest at heart. Always, always be an example to your children. Live what you teach. Your children will have a very hard time developing a testimony of things if you are a hypocrite. Yes, you will make mistakes. That is not being a hypocrite so long as you are willing to repent and make amends for those mistakes. This is a great post 🙂 Thank you for the reminder! We work hard to read the Bible every morning at breakfast. That way our son is at the table and his hands are busy. He has major incentive to stay seated as he is eating. He is young (22 months) so I don't think he is comprehending much, but it is establishing the routine. Thanks for the reminder and encouragement!! !